The analysis provided in this section traces the development of Macbeth as a character. How he understands himself as a man, masculinity and gender and how they are related to his ruthless ambition and the critical moments of his decision-making. Other areas addressed are when things change for him and the influence of the witches on him and whether his fate is sealed. In Act 1 scene 2, the captain introduces Macbeth as a brave character who has just unseamed the enemy from the nave to chops. When the news reaches King Duncan, he shouts “Oh Valiant cousin! Worth gentleman!” Initially, his ambitions are made clear to the audience through his use of asides and soliloquies. His goals conflict with the opinions that people have on him which he sees as golden (I: 7, 33). He is brave and fearless in battle. However, his is concerned about the thoughts of the witches prior, during and even after he murders King Duncan. Prior to committing the murder of the king due to the frustration of the king passing his kingdom to his son Malcolm, he suffers pangs of conscience. In scene II, one of the witches shows the others the chopped thumb of “a ship’s pilot” as it shipwrecked on his way home. 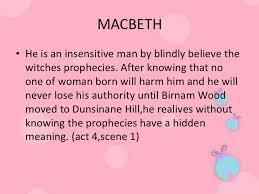 The witches predict that Macbeth will become the Thane of Cawdor and from that point forward King. When he is bestowed with the Thane of Cawdor title, he realizes that his fate is sealed to the predictions of the witches. The witches further predict that Banquo, Macbeth’s friend will father an eternity of a line of kings. When the Lady Macbeth receives the letter with the news, she prays that the devil possess her mind, turn her breast milk into bile and have a man’s ability to perform evil. It is from her reaction that we realize she knows that Macbeth will kill the king. On his arrival home, Macbeth is taunted by Lady Macbeth. His masculinity is ridiculed, and the lady does this to provoke him into committing murder. At this juncture, things change for him. Lady Macbeth is cold as she recounts of a baby with a smiling face she once suckled, and imagines that it would have been better to smash out its brains than making a promise she never intended to keep (I. 7. 13). She does this to provoke his husband into killing the king. Macbeth becomes most human and sympathetic once his wife mocks his manliness. To ascertain his manliness, Macbeth promises, and they both agree to kill Duncan. However, Macbeth becomes more conscious of guilt and almost aborts the mission. After killing him, he carries the knives he used to kill the king, and this forces the Lady Macbeth to go to the king’s bed-chamber and complete the kill. She plants the knives to cast a shadow of suspicion to the guards whom she drugs with a sedative. When confronted by the sight of the dead king, she realizes the enormity of the deed and reflects that it reminded her of her father once he was asleep. After the death of the king, Macbeth is left alone as the dominant personality as the Lady Macbeth disintegrates. He is confronted by guilt (the appearance of Banquo’s ghost (Act 3, Scene 4)), fear as he plots a murder series to secure his throne and becomes pessimistic after his wife’s death. The ghost makes him what is and is not (I: 3,142). He succumbs to despair, and these are indications of tension that engulfs Macbeth. He is confronted by two extremes. On one hand, he is too ambitious and willing to do anything including killing to secure his position at the top. On the other hand, he is too conscious to live happily as a murderer. The death of the king upset the natural order of things in the world. For example, horses devour each other after going insane which is a reaction to the crime committed by the Macbeths. Even after suspicion from some of the Scottish thanes, Macbeth is still crowned king. He is further plagued by the predictions of the witches and realizes that he will not enjoy his position as king until Banquo and all his sons are dead. In Act I scene 3, he decides to have Banquo killed and convinces the two murderers that Banquo wrongs warrant his death. The voices of his wife are his head motivate his actions that a real man kills his enemies. On his way to the banquet, Banquo is murdered. Over the course of the play, the Macbeth's character undergoes several changes. On the onset, he is a reputable warrior who earns favor with the king through his bravely in battle. However, he changes, motivated by the need for power and to fulfill the witches prophesy. He seizes to be a man of his own as his actions are motivated and compelled by his quest to prove his is a man in the eyes of his wife. He turns to be a man of unquestionable character, hungry for power, insatiable and pessimistic. Even after the death of Banquo he is neither settle nor happy since his son Fleance escapes. His belief is installed on the witches as he goes to them, and they make incantations “Double, double, toil and trouble... bubble” (4:1. 1-7). He further learns that the Thane of Fife has left the country, and he becomes paranoid. His resolve is to kill the Macduff’s family. At this point, he is just a man who has lost his direction. As Lady Macduff’s little son says; there are more people who are bad than good in the world. Act V introduces Lady Macbeth as psychotic, ill and confined to her bed-chamber. The doctor attending her is asked to cure her illness by Macbeth. Through her confines to the doctor she discloses her part in killing King Duncan and the doctor advises the king that she needs a priest, not a doctor. She later commits suicide. Her departure does not move Macbeth to the very least as he says “she should have died hereafter." He is portrayed as unmoved and resigned to fate at this point. As the play comes to an end, the conflict is resolved as Macbeth is killed, and Malcolm restored as king. The witches prophesy came true which stipulates that the life of Macbeth was engraved in fate. His will, decisions, and quest were futile since he did not overcome prophesy even after numerous killings to maintain his legacy and throne. Furthermore, his secret was revealed through his wife’s illness and consequent night walks as she recounted her part in killing Duncan to the doctor. Here the concept of manhood is defined from Lady Macbeth’s perspective. An analysis of whether Macbeth agrees results and why he is convinced to adopt Lady Macbeth’s argument (vii. 35-59)? A contrast of Malcolm's and Macduff's views on manhood (IV. iii. 213-235). The initial view of manhood by Malcolm and his latter view and how they describe him (IV. iii. 125-132)? There are two contradicting views of manhood as seen in the eyes of Malcolm and MacDuff. The latter presents a different kind of masculinity as he is not afraid to weep on the discovery that his family had been slaughtered. On receiving the news, he is first in shock and yearns that by some miracle some are alive. In shock, he says, “All my pretty ones? The hen and all her chicks?” He realizes as a man he had left his family defenseless against the tyrant Macbeth. Malcolm consoles him and further encourages him to take the news in a manly form; through seeking revenge. Here MacDuff shows Malcolm that he is mistaken about manhood. Malcolm suggests “Dispute it like a man," to which MacDuff replies, “I shall do so, but I must also feel it as a man” (4.3.221–223). Siward received the news of his son’s death with complacency. A view that Malcolm reacts to by indicating “he is worth more sorrow...” (5.11.16–17). This later position of Malcolm contradicts his earlier description of “taking it like a man." Macbeth adopts the concept of manhood from Lady Macbeth as he realizes that it is not all about violence but deception and manipulation; a concept he applies to convince the murderers of Banquo. He convinces them they belong to “the valued file” of men, and their manhood is based on their ability to kill. Through this, he uses them to justify the end of Banquo as he convinces the murderers that he deserves to die. He plots his murder by preparing a banquet for him during which Banquo is killed on his way to attendance. As the play comes to an end, the viability of the definition of manhood does not count since if it did, he would manipulate his way from Malcolm and MacDuff. On the contrary, he dies by the sword as he used to kill his victims. In the development of the theme and the characters, several themes are used and the focus being given here is darkness and light. Darkness is a symbol of evil; something bad deemed to happen while is associated with good and life. In the book, Lady Macbeth prays for a “thick night” to come entangled with the “smoke of hell” (1.5. 57-58). She yearns for this characteristics so that her knife does not see the wounds it makes on the king as he sleeps peacefully. The darkness is a symbol of the evil she plans on committing. She further calls for murderous spirits to prevent the heavens from peeping via the dark blanket. In this implication, light is associated with protection from evil and is the only thing that could deter her from murdering King Duncan (1.5.60-61). It is a fact that she is superstitious since as she starts going crazy she insists on having a “light” or candle around her (5.1.23-24). She is convinced that the light will protect her against the dark forces she summoned. A fact that does not hold as she succumbs to death through suicide. Further symbolism is seen as Macbeth receives the news of his wife’s death and chants “out, out brief candle” (5.5.26). It symbolizes that her sudden death is similar to turning off the candle’s flame. During the murder of Banquo, his torchlight is snuffed at the moment he dies (3.3.27). A symbol of human life departs them, and they are no more. No knowledge of the surrounding as it’s all engulfed by darkness. In the evening of the king’s death, the fire in the chimney was blown out mysteriously as reported by Lennox (2.3.63). Cookson, G. 'Macbeth'. English 1.5 (1937): 431-432. Web. Shakespeare, William. Macbeth. Chandni Chowk, Delhi: Global Media, 2007. Print. Shakespeare.mit.edu,. 'Macbeth: Entire Play'. N.p., 2015. Web. 14 Apr. 2015.